Today, I am literally wearing a flour sack. 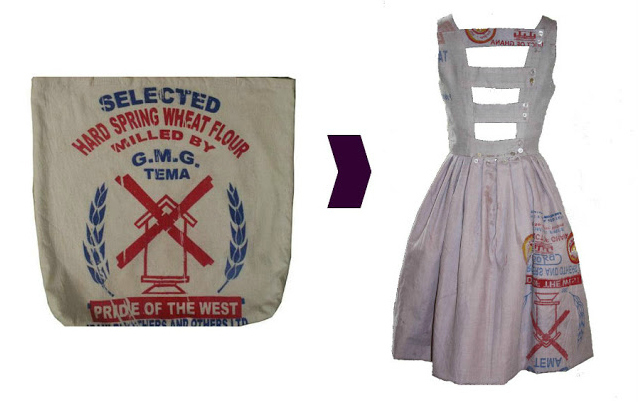 It's not your average flour sack (whatever that might be...is there such thing as an average flower sack?) Anyway, this vintage inspired dress by Indianapolis based design company Liz Alig is constructed from recycled African flour sacks. Owner and head designer Elizabeth Roney founded the company on principles rooted in a commitment to fair trade and ethical production of her clothing from fabric to sewing. 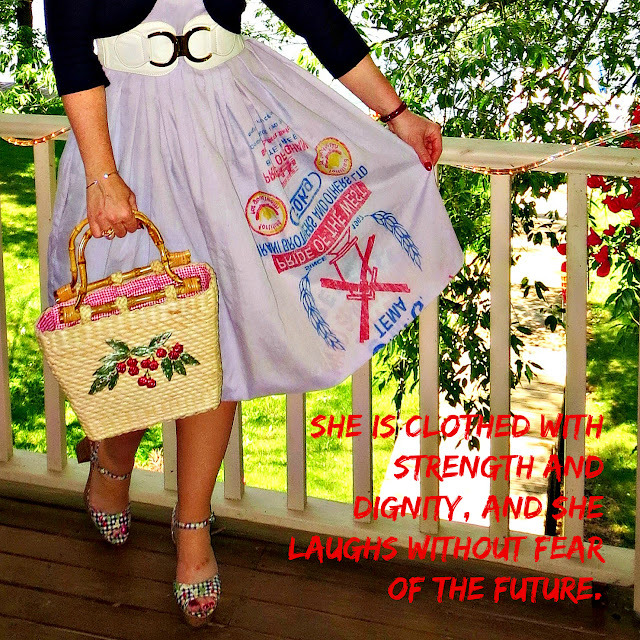 This incredibly soft cotton dress (called the "Lucy" dress) is the result of a partnership between Liz Alig and Global Mamas. Global Mamas is a non-profit organization in Ghana working to help women in Africa become economically independent. Their purpose is to reduce the economic inequality of women by helping to significantly increase the revenues and profits of women-owned businesses through facilitating the export of Global Mamas fair trade products. This in turn increases wages, generates new jobs and improves the standard of living for women, their families, and the larger community. Because these dresses are hand dyed and handmade from recycled material, each is as unique as the women who make them. When I met the founder of Liz Alig at a local designer open house last Winter and first laid eyes on this dress, I was immediately attracted to the 1950s silhouette and soft, chambray hand. When I learned the story behind the dress, I fell in love. 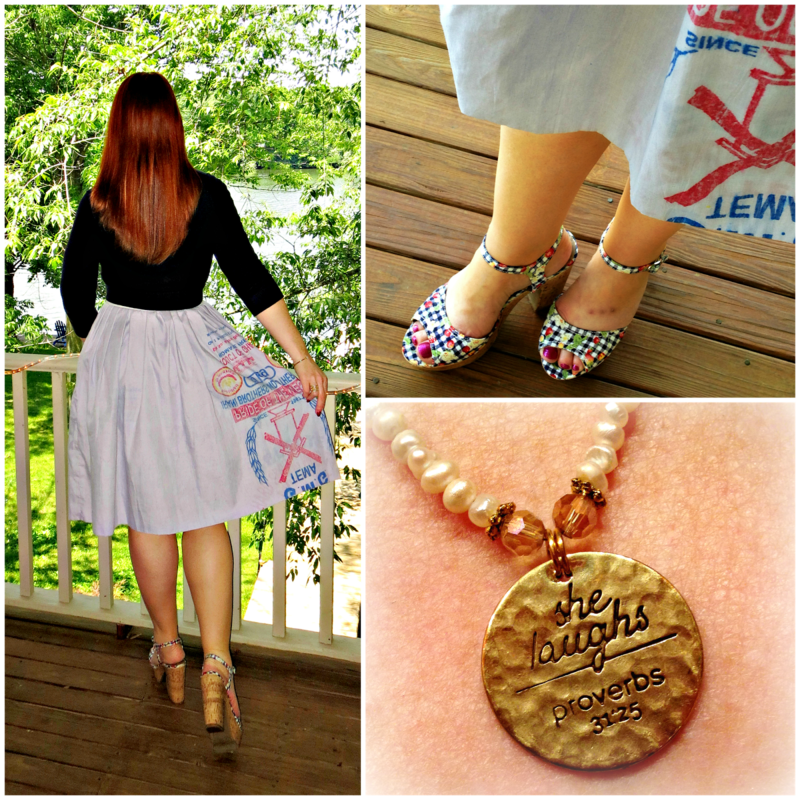 It seemed appropriate to pair my Lucy dress with a delicate, hand-strung freshwater pearl necklace that bears the inscription "she laughs" in reference to Proverbs 31:25 - "She is clothed with strength and dignity, and she laughs without fear of the future." Much like the dress, the necklace is also the product of an organization working to transform communities through holistic economic empowerment that brings dignity and opportunity to individuals who have been caught in a web of poverty and injustice. Fashion & Compassion works in both the US and abroad to accomplish its mission by providing employment opportunities and fair wages to vulnerable populations, and educating the public about the injustices facing women around the world. My necklace, in particular, was handcrafted in Charlotte, North Carolina by artisans employed through the Freedom Jewelry Project, which helps local women escape the cycle of poverty and abuse. Both the Lucy dress and the necklace are tangible reminders to not take for granted how very fortunate I am, but also that there is hope for a world in which all women are clothed with strength and dignity.